Bringham is a village and a civil parish in the English county of Norfolk. The village is 9.9 miles east north east of the town of Fakenham, 13.3 miles west south west of Cromer, 22.3 miles north north west of the city of Norwich, and 124 miles north north east of London. The nearest railway station is at Sheringham for the Bittern Line which runs between Sheringham, Cromer and Norwich. There is an abandoned railway line which is considered as a footpath, it runs parallel with an old track "the lane" that leads up to "belle vue tower". The nearest airport is Norwich International Airport. The civil parish had in 2001 census a population of 122, increasing to 130 at the 2011 census. For the purposes of local government, the parish falls within the district of North Norfolk. Briningham has an entry in the Domesday Book of 1085. 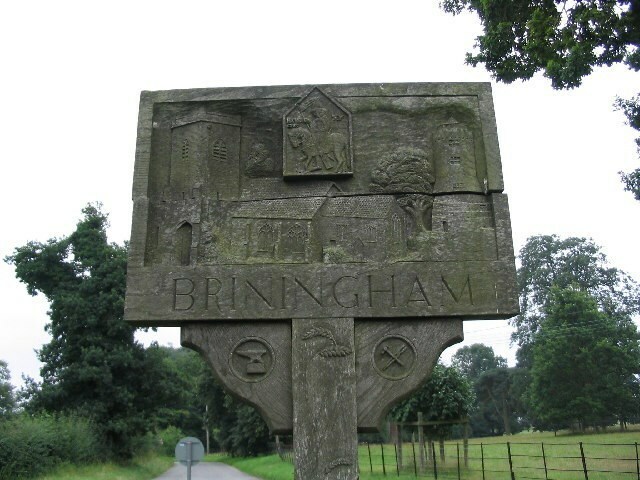 In the great book Briningham is recorded by the names Bruningaham, and Biringaham. The main landholders were Count Alan and Bishop William. The main tenant is said to be Roger Longwood. The survey also mentions that there are five beehives, a church and a mill. The main and oldest buildings are Belle Vue tower, originally thought to have been a mill but is now a private house; Rose Cottage, the mission hall; the old Methodist chapel, and the Mill Lane houses.